This entry was posted on August 29, 2016 at 9:46 am and is filed under Action, Crime, Drama, Western with tags 2016. You can follow any responses to this entry through the RSS 2.0 feed. You can leave a response, or trackback from your own site. And regarding Westerns, don’t forget last year’s 3 time Oscar winner The Revenant! True! I didnt even think of that. I love the way director David Mackenzie goes back and forth between both the Rangers and well as the two brothers. He extracts such suspense. The way the Rangers tease one another belie the closeness of their relationship that could only develop from years of working together. I was rooting for the bad guys and the good guys. I too was surprised at how good this was. Very good performances. 4 stars. I’m curious to see if any any of those performances garner Oscar nominations. Great review. I also found the shades of gray to be its strong point. You sympathize with everyone and no one. I did only feel compassion for Gil Birmingham’s character, Texas Ranger Alberto Parker. He was a sensitive soul. I’m a big fan of David Mackenzie stuff, Mark. I’m quite surprised he’s tackling this genre but It looks and sounds great all the same. Fine review my friend. I first became aware of David Mackenzie through Starred Up. He has remained a relative unknown – in the U.S. anyway. This film should be his breakthrough. Here’s hoping. I was huge fan of Perfect Sense. That’s a vastly underrated gem. I want to jump with joy. So glad you saw this and loved it!! It just is endlessly entertaining G with the performances, but there’s so much more to dig into beyond the fun. It’s a really interesting morality play, and now it has just made Starred Up a must-watch for me. This was so good. I wish I had mentioned Gil Birmingham more in my review, too. He is gonna go underrated here. I thought he looked familiar. Apparently, he’s been acting since the 1980s. Side note: He played Taylor Lautner’s father in The Twilight films. 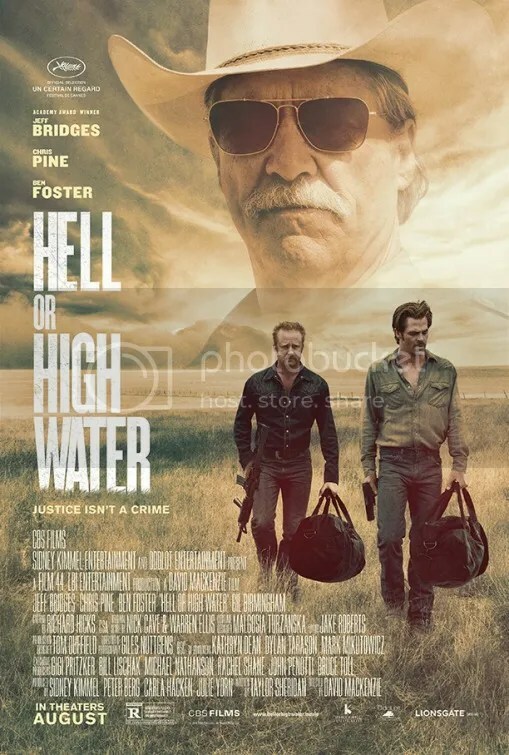 Thrilled to hear that you were pleasantly surprised by Hell or High Water. I’m shocked that it wasn’t on your radar. It’s definitely a heist picture with heavy influence from Westerns. I agree that Mackenzie has an uncanny feel for this material and that he’s brilliant at establishing characters. Everyone feels so layered and complex in this tale, which I love. I also agree that Ben Foster is mesmerizing and that Chris Pine gives the performance of his career with this soulful turn. I really appreciate that no one person is all good or bad. The shades of grey make things interesting. This is one of my favorite films from 2016. Definitely in my top five. This came out the same week as Florence Foster Jenkins, Pete’s Dragon AND Sausage Party. That’s what was on my radar. There was no promotion for this. Totally makes sense. That’s a large slate of releases to be concerned about. Well you most certainly have sold this film to me Mark. What a stellar review. Thanks. Seems fitting. It’s a stellar movie! I will have to check it out ASAP. It’s now showing up on many critics year-end Top 10 lists. Somewhat surprising that one of the most critically acclaimed movies of the year was released at the tail end of the summer. Glad it got noticed because it’s really great.